These racks have been in the cellar of the old farm house here at Victory Seeds on the Dunton Farm for all of my life, and all of my Dad's life. I am guessing that they are at least 60 years old and with the exception of a couple of screens that I have abused for make-shift animal cages, all are in quite serviceable condition. 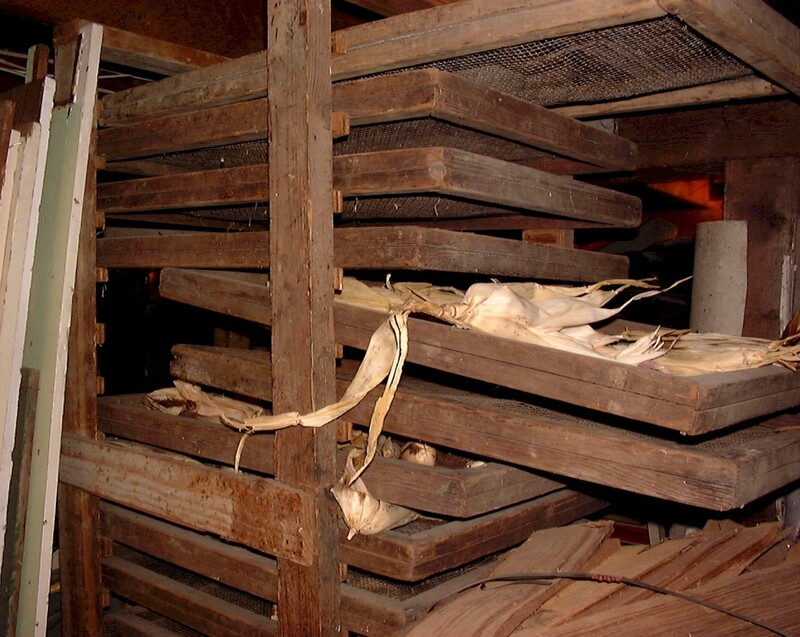 The racks and screens were used by my ancestors to dry nuts. One of the big cash crops for the farm in past years was walnuts and filberts. 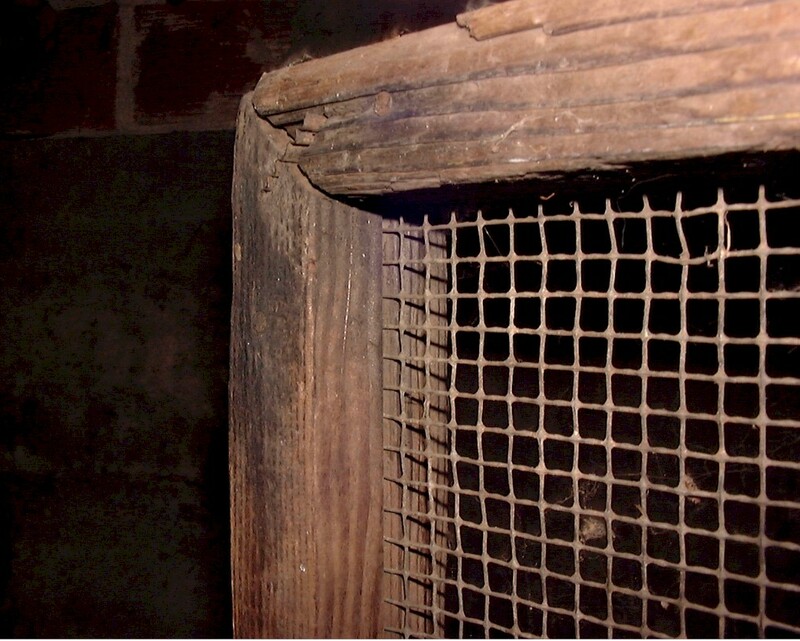 The racks were placed in the cellar of the farmhouse instead of an outbuilding because the heating system, an old wood-fired furnace, is located there. It provides the heat and air circulation necessary to quickly cure the nuts. The screen construction (see notes below) are stout enough to handle a huge weight load. I would say 20 to 40 pounds of wet nuts is no problem. They should be quite adequate for handling any type of large seed drying requirement, i.e. peanuts, ears of corn, bean and pea pods, etc. Rack with screens. 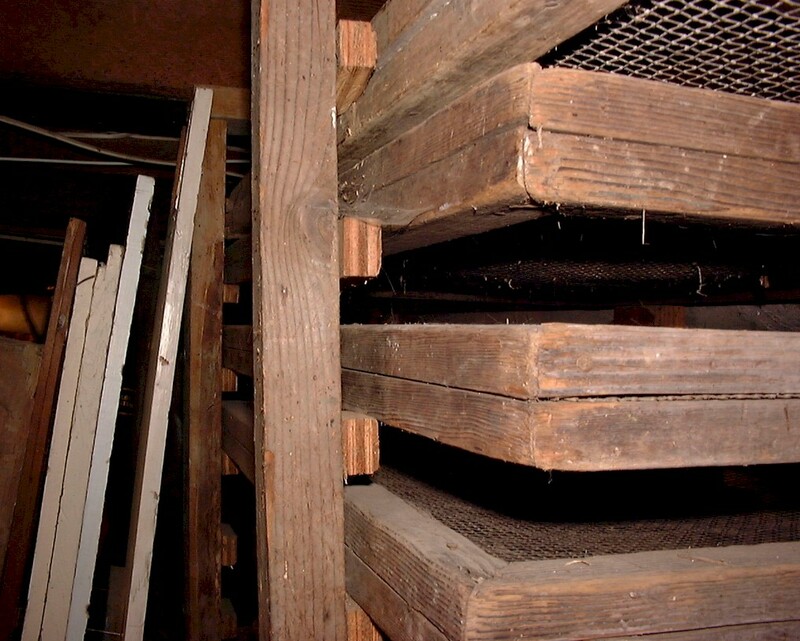 The rack structure is basically four 2 X 4s that go from the cellar floor and are nailed to the floor joists of the first floor above. Close-up of screen guides. Basically just strips of wood (in this racks case, 3/4" plywood) nailed to the inside of the sides. Screen. The outside dimensions are 2' x 3'. Close-up detail of screen construction. The assembly is a 2' X 3' frame was made out of 1" X 2" heartwood Douglas Fir. Corners are mitered nailed from ends and reinforced with corrugated fasteners*. 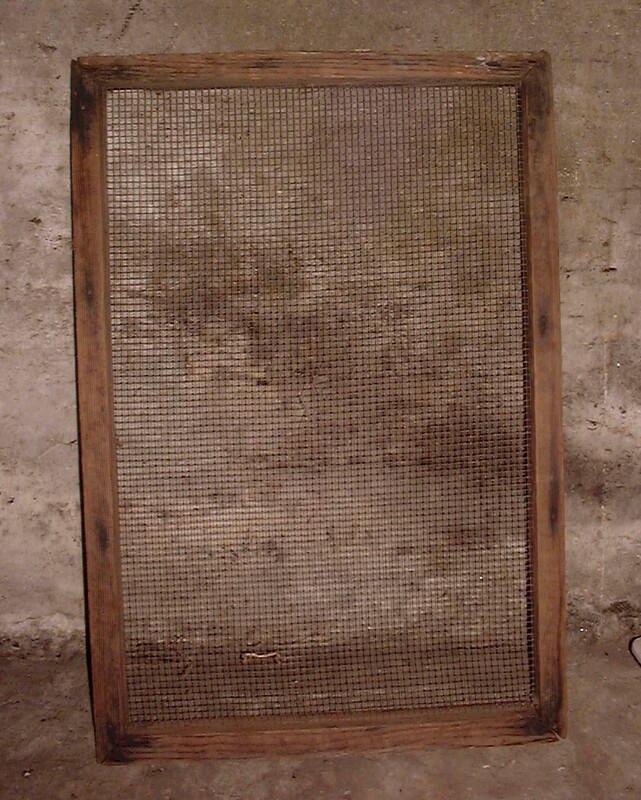 Next the galvanized wire mesh (a heavy, rigid wire with about 1/4" grid) was laid on top or the frame and another, identical frame laid on top of that to trap in the screen. These are nailed to each other. * - A corrugated strip of metal with one edge sharpened for driving into the joint. The fastener is placed at a right angle to the line between the members, half on one member and half on the other, and driven down flush with the member. The corrugated fastener mars the appearance of the surface into which it is driven; therefore, it is used only on the backs of picture frames and the like.